From batteries to biology, salt-containing liquids are vital to continued performance. Accurately understanding the behavior of these liquids relies on correctly depicting the molecular structures they form. Dr. Marcel Baer, Dr. Timothy Duignan, and Dr. Christopher Mundy at Pacific Northwest National Laboratory determined that the precise structure of a pair of ions isolated in water accurately reports on how a whole solution will behave. "This accurate local structure is the important piece in relating the microscopic to macroscopic, or intrinsic properties of the ions in solution to collective properties," said Mundy, who led the studies at PNNL. By integrating calculations and experiments around two ions that form an ion pair of salt, the team can understand the collective nature of the solution. Namely, the team can understand the clustering statistics as it relates to the specific behavior of the ions at different concentrations, which is measured by the osmotic coefficient. Specifically, does the electrolyte form into clusters or stay as isolated ions at different concentrations? The behavior and speciation of electrolytes influences everything from their use as battery electrolytes to their behavior in complex nuclear waste. By understanding how individual properties of ions inform their collective behavior, scientists can determine how to tailor the concentration and type of electrolyte for specific applications. The team examined how the correct molecular structure influences the solution's thermodynamics. They determined the structure through extended X-ray absorption fine structure measurements and molecular simulation based in quantum mechanics. 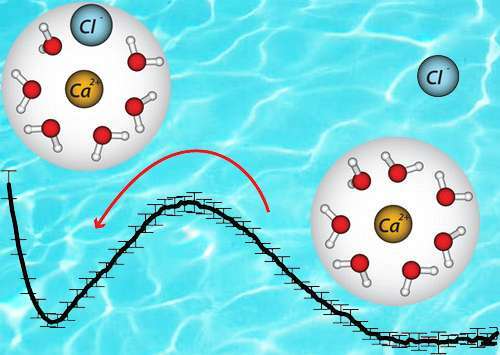 The team's work demonstrates that it is possible to predict the degree to which ions are paired in solution (called activity) by using accurate descriptions of the local ion-water, and ion-ion interactions. In a concurrent invited review article with Dr. Tim Duignan, the team demonstrated how to get the pairing right with high-level calculations. The results provide the necessary molecular detail to improve macroscopic theories of ion solvation.